This article originally appeared on MarketingBitz. Read the original here. Videos offer a proven way to increase your conversion rates, but producing them can be expensive. It may seem impossible to take advantage of video’s power to boost your sales without breaking the bank. However, what if I told you that you may already have most of what you need to produce videos? Whether you’re creating a tutorial, demoing a product, or advertising, videos don’t actually need to be an expensive endeavor or a big production. With that in mind, in this post we will show you how to capture, edit, and publish videos online with nothing more than a barebones budget. Let’s cut to the action! Whether you’re creating a product tutorial or marketing spot, you’ll want a game plan for each video. The first step is to produce a script. When scripting your video, write down every word. After you’ve written the script, try reading it out loud a few times and adjust it as necessary. Some sentences sound better in writing than they do spoken. If you want to include multiple shots, create a storyboard to account for everything you’ll want to include. The better prepared you are, the better the end result will be. Preparation may take time and attention, but it’s well worth the reward! Aside from hours spent on labor, the most expensive part of video creation is the equipment. Thankfully, you should be able to avoid spending much (if any) money on the necessary tools. When you’re on a budget, it’s important to use resources already available to you whenever possible. As it turns out, your smartphone is surprisingly capable of capturing decent footage; it could offer all you need. If you don’t have a smartphone, there are still affordable options. First, check any of your existing digital cameras for video recording capability. If that’s a no-go, it may be time to pony up some cash for a camera. In most situations, a high-definition webcam that records directly to your computer should do the trick! For a slightly more professional quality, try a basic model of a DSLR camera or something similar. When it’s time to shoot, secure your camera to a tripod, which will improve the quality of the video by reducing shakiness. If you want to go the extra mile, experiment with attaching an external microphone for better audio. With your camera equipment in hand (or on a tripod! ), you can now record the footage dictated by your script. Many computers come with basic video editing tools, such as Windows Movie Maker or iMovie. Using existing software tends to be easier, because you don’t need to worry about configuring something brand new. If your computer doesn’t have editing software (or if you want a more powerful editing suite), give Shotcut a try. 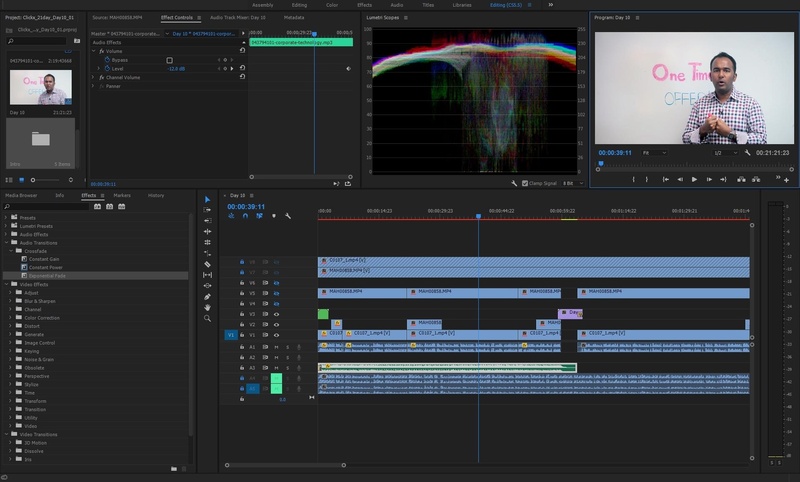 It’s a free, open-source video editing program that’s compatible with Windows, Mac, and Linux. Personally, we use Adobe After Effects and Adobe Premiere. Learning the nuances of video editing can be a lot of fun, but it can also be frustrating at times. Most popular editing tools come with their own set of video guides, which is a solid place to start in terms of improving your skills. If you can’t find what you need from the software provider, try searching YouTube or Google for supplemental tutorials. At this point, you should have double-checked your video for any final edits. Once all of the edits have been made, now you almost have a final, edited video ready for the world to view. You can take your pick of video hosting sites, such as YouTube or Vimeo. While uploading the video, you’ll first need to create a video title, description, tags, and additional elements such as annotations, end cards, and thumbnails. When creating the video title, use descriptive keywords that summarize the key points of your video. To describe the video, create a lengthy summary of the video’s content along with relevant URLs. Feel free to add video tags or additional elements to help your video get optimized and discovered. Once you add any necessary video elements, your video is ready to be published and uploaded. Once the upload process has completed, you’ll be provided with code to embed your video on your website. If you’re using a content management system such as WordPress, integrating videos within your content is a piece of cake; not to mention the advanced functionality possible (such as video backgrounds). YouTube makes the video upload process a cakewalk. Finally, you can link directly to the video’s URL via any of your social media accounts, and the platform will do the rest in terms of offering a preview of your video in all its glory. Producing videos doesn’t have to be expensive; on the contrary, you can take advantage of the benefits of video marketing using tools you already have for the most part. The only thing left to do will be putting in the time to create the video! A smartphone, webcam, or camera for video recording. Preinstalled or open-source programs for video editing. Now that you have what you need, what is the first marketing video you’ll create? Ask us any of your video production questions in the comments section below!